A typeface like Liza is fully packed with technological novelties. At the time when Liza was released (July 2009), many of these were not supported everywhere yet. For example, only a couple of months after being released, Liza’s contextual alternates finally behaved nicely in TextEdit. Another aspect which was very new at that time, were descriptive names for Stylistic Sets. Those of you who use Stylistic Sets regularly, know that these powerful features can be a headache to use. First of all, they are likely not supported in your favourite application. And if they are supported, they are hidden very far away in the user interface. 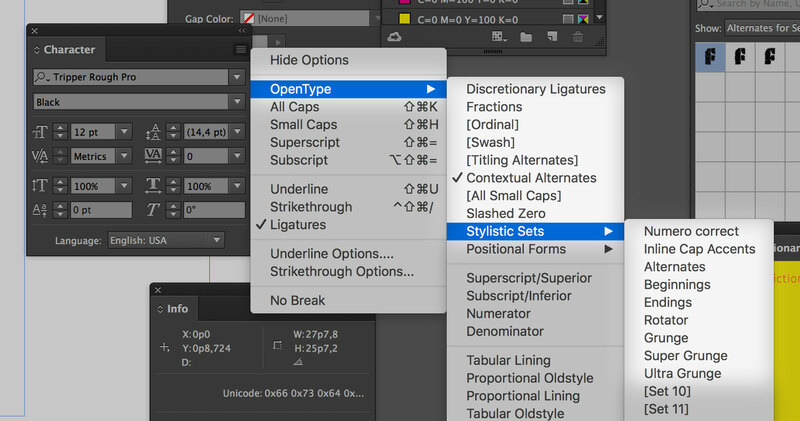 InDesign users first have to discover the hidden OpenType menu, and only a submenu later a list will appear: Set 1, Set 2, Set 3, etc. The user doesn’t have a clue what every set does. This list is a typographic lucky bag. But it’s now no longer necessary to remember what every set actually does, because the most recent version of InDesign will show a descriptive name for each stylistic set. Instead of listing them as Set 1, Set 2, Set 3, InDesign will show a text in case these descriptions are included in a font. In case you’ve bought Liza 7,5 years ago, you can now finally see in InDesign what that Stylistic Set will do for you. Optionally you can swing back to the description of Liza’s OpenType features on our website. 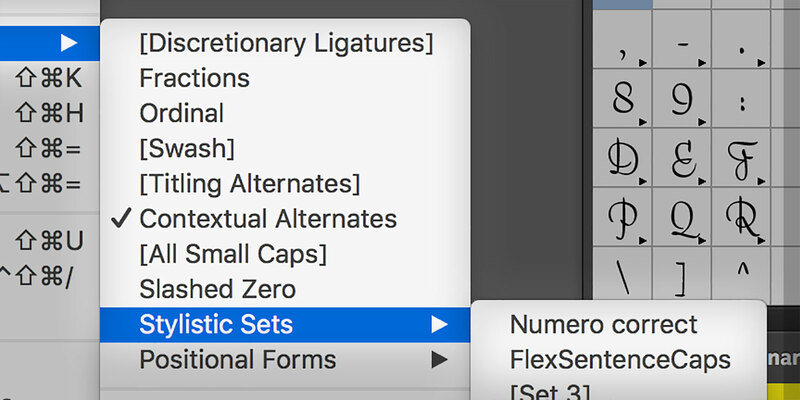 All our fonts contain Descriptive Names for Stylistic Sets (Numero Correct is by default in Set 1 in all fonts), but some fonts are supplied with more sets than others. If you work with Tripper Rough for example (released 1,5 year ago), you’ll be very happy that InDesign now supports descriptive names in the interface, because you no longer need to guess which set is Grunge, Super Grunge or Ultra Grunge. We’ve been pleading/hoping/waiting for a better OpenType UI since many years. It’s still a very long way towards a better OpenType interface and better OpenType support, but this is at least one tiny step in the right direction. Thanks Adobe.